Happy Friday!! So who already did some damage at the Nordstrom Anniversary Sale??? Raising both my hands right now. 🙂 If you shopped online yesterday, you probably already know, but Nordstrom’s site went down yesterday morning and for many it was down most of the day. I was finally able to get my purchase in after work, and I am so excited with my first order of the sale! Did anyone go to the store yesterday?? I did last year and it was madness, so I was happy to shop from my computer this year, even if I had to wait out the technical problems. Yesterday, I posted about my predictions for some of the top selling (aka will probably sell out) items of the sale, you can check it out HERE. I’m also sharing a little look inside my shopping cart below. OK enough Nordstrom sale talk, let’s discuss this outfit. 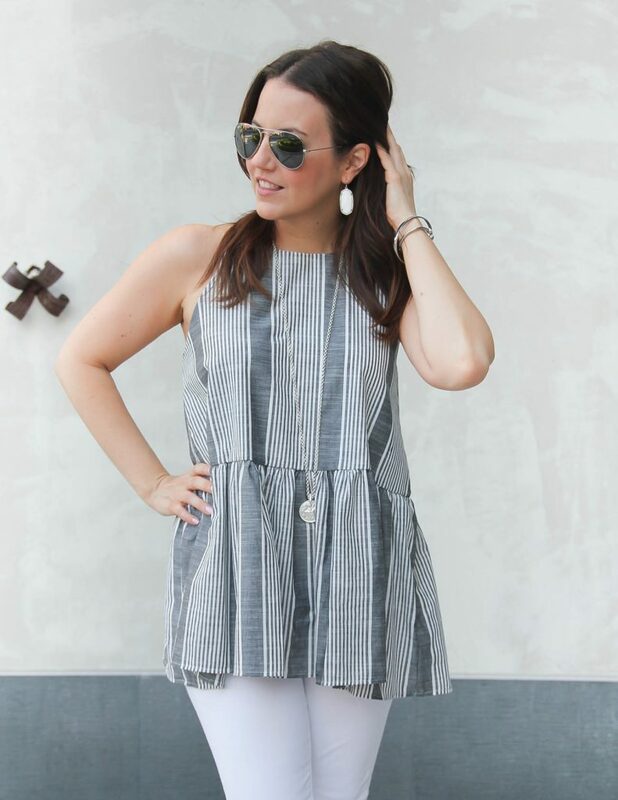 This gray striped halter top is the cutest top for summer. I have been majorly crushing on all things gray for a few months now, and I have always loved a good stripe. This top put both of those things together for a match made in heaven. The halter top design has been a summer favorite style of mine for YEARS! I think it looks really flattering on a variety of people. The high shoulder cut can really help give you the look of a more defined shoulder which I think can also make your arms look a little more toned. It’s just a great overall silhouette in my opinion. FYI On this top, It does run big, so I would definitely size down. What goes better with gray than white, am I right?!? 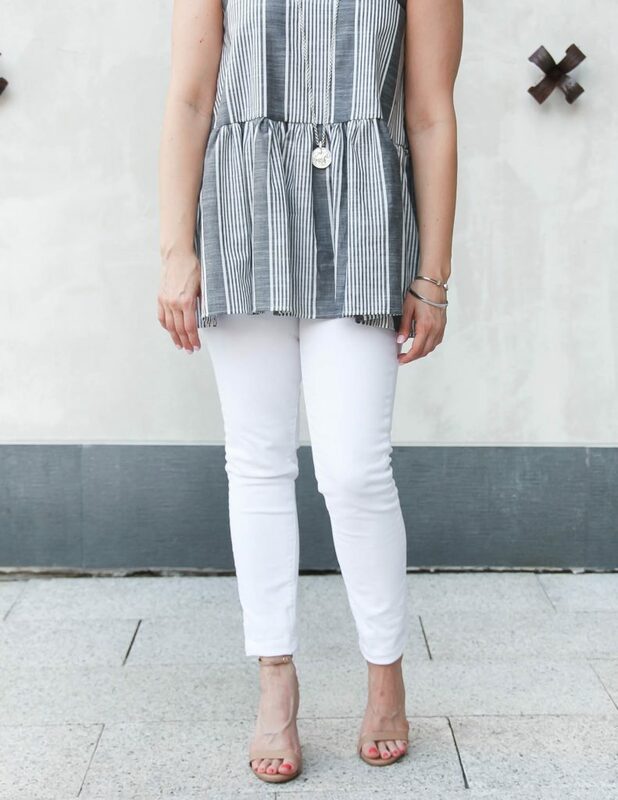 This top does look cute with black jeans and shorts, but I think white skinny jeans are really the perfect pairing. Since the top has a bit of volume, I chose my simple Stecy sandal over wedges. 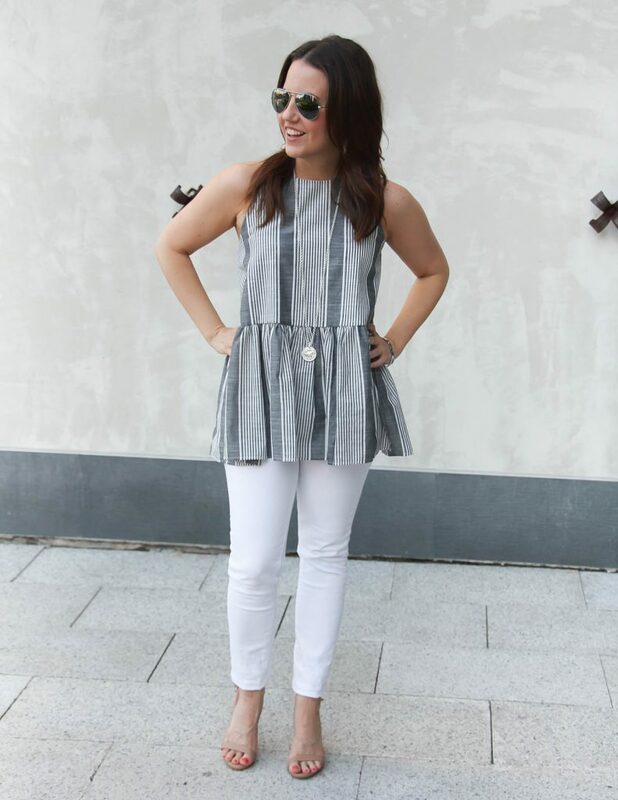 I think the simple sandal really helps offset the volume of the peplum a bit. Alright you guys, have a wonderful weekend! 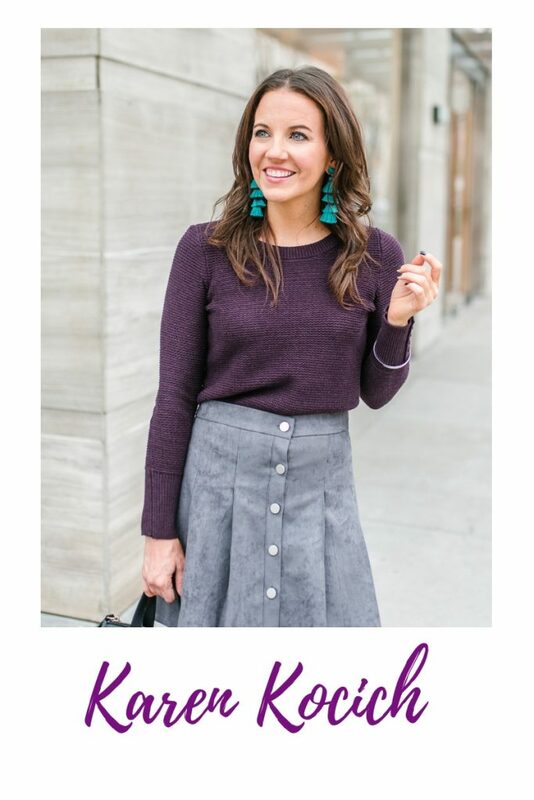 If you have shopped the Nordstrom sale, leave me a comment and let me know what you bought! I’m always so interested to see just what people buy in a major sale like this one. Thanks for stopping by! Happy Nordstrom Anniversary Sale Day!!! 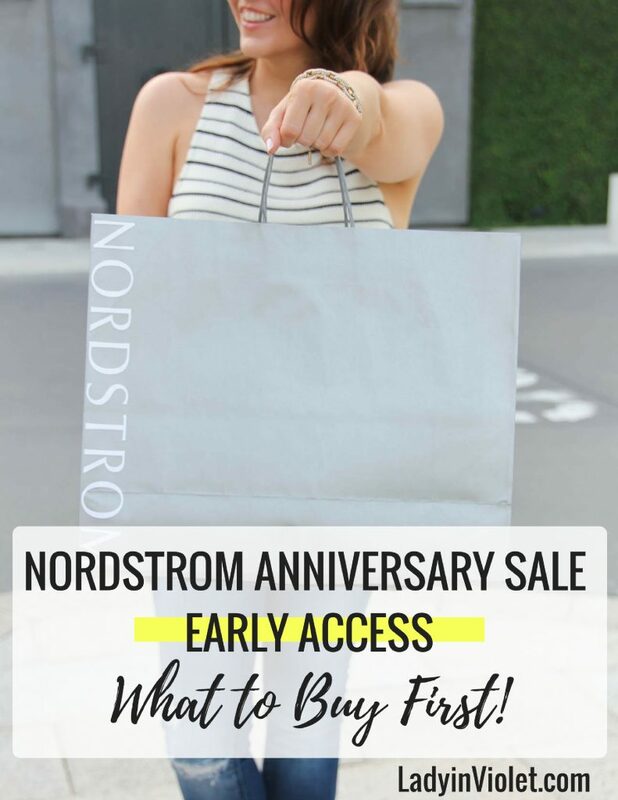 Alright my Nordstrom Cardholders, start your engines because The Nordstrom Anniversary Sale 2017 Early Access is officially open to shop! Ya’ll this sale has so many good items this year. My wish list is crazy long right now. I usually shop the sale 3-4 times each year. Mainly on early access day 1 online, the Wednesday or Thursday before Public Access in store, and usually one last time before the sale ends online. FYI – if you really want to go in store, today and the first weekend of public access will be madness!! I have found those couple days right before public access starts to be the perfect time to shop in store. Also, if you don’t have a Nordstrom card at least where I go, you can still walk into the curtained off areas and look around, you just can’t purchase without a Nordstrom card. I usually make 90% of my purchases online, because I’m personally not a fan of shopping when stores are super busy. Nordstrom does offer an in store pick up option, so you can order online and get your items same day. BUT – I did this last year and one of the items I ordered was no longer in stock at the store when they were pulling my order, so they cancelled that item. Luckily, I was able to re-order it online, just something to keep in mind if you choose this option on the first day of early or public access when things are selling fast. Yes, things will sell out today. Some things will sell out online before many have finished their coffee. No worries if you aren’t a card holder, there will be plenty left and items get restocked. Last year, the bag and bracelets I purchased both sold out in the morning. Both items also came back in stock at some point during the 3 weeks, but you have to keep an eye out. As soon as things come back in stock, they will then sell out again. I am a huge fan of this sale for buying wardrobe staples like cardigans, jeans, and boots. Once I have my staples, I then add in other items I’m loving from dresses to bags to jewelry. I wanted to share not only some of my top picks from the sale, but some of those top selling categories during the Nordstrom Anniversary Sale that I have noticed tend to sell out quickly in previous years. If you are totally overwhelmed and trying to figure out where to start, I would say these categories are a good starting point. You can click any image to go direct to the item, and non-cardholders can still preview the sale and build a wishlist. You just have to wait until the 21st to make a purchase. I picked a mix of designer bags and bags under $100. I was really impressed with the selection of handbags under $100 this year. Backpacks are a growing trend, and I included a few with a super chic feel. The booties I picked all come in under $100 and most of the boots come in under $200. I had a few over like the Tory Burch ones which are always one of the fast selling of the sale. Leather jackets and long cardigans always tend to be the clothes to sell fast during the sale. This sale is the best time to buy a leather jacket because we probably will not see these markdowns again until after winter. I have about 3 or 4 long cardigans on my wish list right now. #obsessed They are the perfect layering pieces and cozy to wear around the house. Casual dresses are another area that sometimes sell a little quickly. I only included a couple of my favorites because for me this isn’t a wardrobe staple, so it’s not one of those first areas I add to cart. A couple bonus items made it to the list that I think will sell big this year including a GORGEOUS leather skirt (that is a little pricey, because it’s leather) and a black and white scarf since gingam is so popular right now. One thing not featured in the little pictures is AG Jeans. I love this brand and own a couple pairs. If you need a new pair of jeans, I highly recommend this brand and buying during this sale. These prices are some of the lowest of the year for AG. They do sell fast, but they are restocked heavily throughout the sale. If you are shopping the sale today, let me know what you buy!!! I’m about to start the always hard task of editing down my shopping cart to the “I still have bills to pay this month” range. 🙂 Throughout the entire sale, I will be sharing all about the Nordstrom Anniversary Sale over on THIS PAGE. You can find all the blog posts related to the sale, my top 100 items of the sale, and more, so be sure to check it out throughout the sale. for the latest and greatest info. You can find the direct link on the menu bar under NORDSTROM SALE. 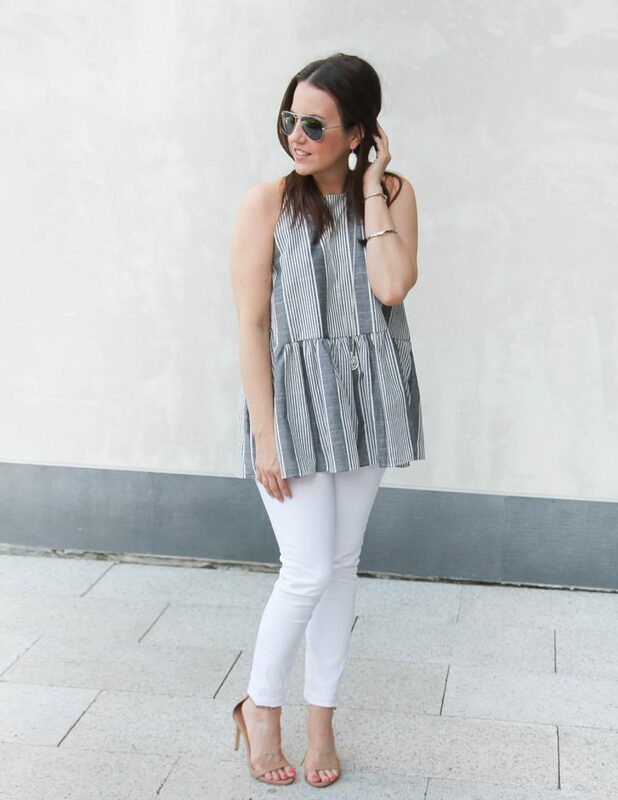 Thanks for stopping by today, and check back tomorrow to see the cutest halter top for summer and what Nordstrom sale items ended up in my cart! See ya’ll then! Hello Hello! 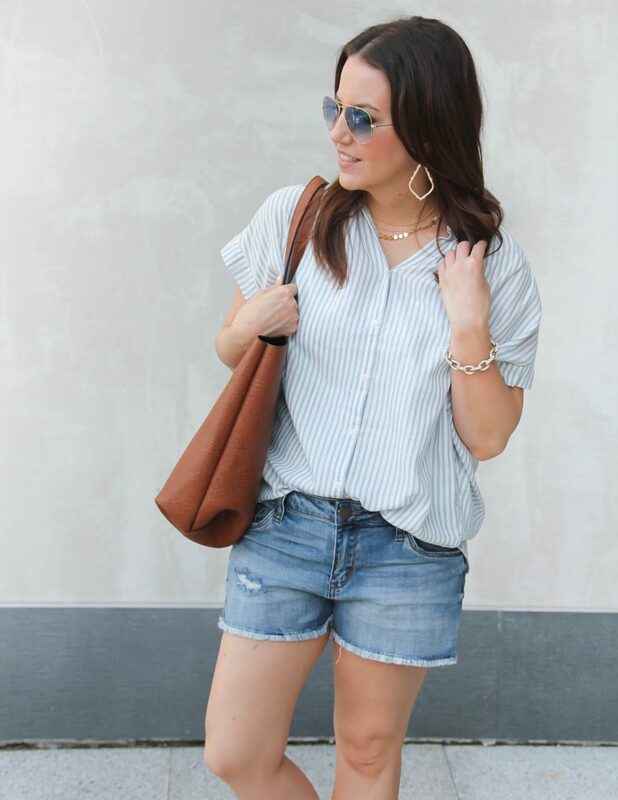 I have another hot weather outfit idea for ya’ll today featuring this super comfy oversized striped top. 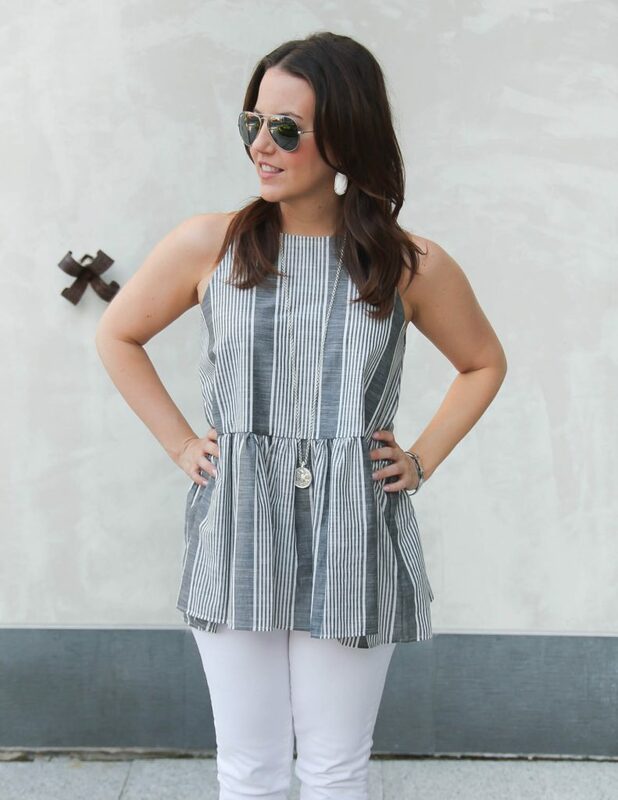 I have been sharing quite a few heat approved tops lately, because a Texas summer is no joke. I love this one because while it’s lightweight, it’s also high quality. The oversized fit and sleeve design really allow breathability to keep you cool. I also like lighter colors like this light blue and white stripe. I’m one who believes lighter clothing does keep you cooler when it’s hot out. If you area heading somewhere with lots of walking, white canvas slip on sneakers are the perfect pick for this casual summer outfit. They really pull the whole casual look together and keep your feet comfy. I like canvas material because I feel like they do a little better in terms of keeping your feet cool and not super sweaty. I picked these up last summer, so I linked a super similar style for you by the same brand. I have also heard great things about the Converse brand too from friends. Alright ya’ll, I am officially on the countdown to the Nordstrom Anniversary Sale! Early Access starts Thursday, and I am ready to shop!! Of course, I will have a post up on Thursday morning with some of my top picks to help ya’ll navigate the sale a little bit. I have already started making my wish list. It’s one of my top tips for shopping the sale without breaking the bank, you can read more of my tips I shared last year HERE. So I will see you back here on Thursday for a list of sale goodies. 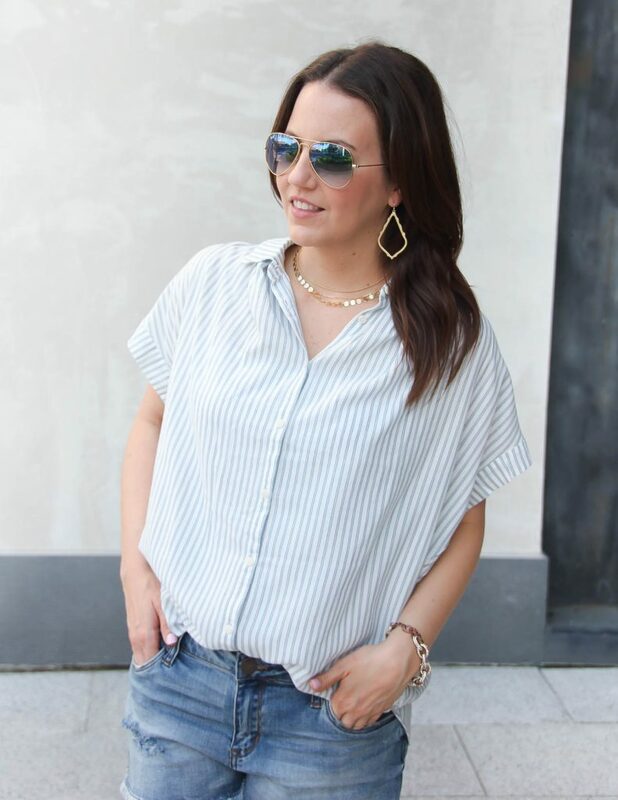 Don’t forget today is Style File Link up day, so keep on scrolling for a little more summer outfit inspiration!